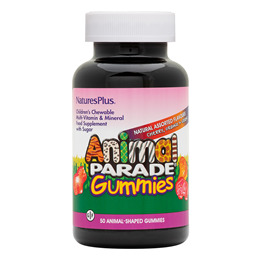 Nature`s Plus Animal Parade Multivitamin & Mineral 50 Assorted Gummies are bursting with chewy, delicious, all-natural orange, grape, and cherry flavours, just two gummies provide a broad profile of nutrients! Rice syrup, evaporated cane juice (natural sugar), gelatin, magnesium citrate, ascorbic acid, d-alpha tocopheryl acetate, calcium citrate, niacinamide, vitamin A palmitate, zinc citrate, ferrous fumarate, calcium pantothenate, pyridoxine hydrochloride, purified water, thiamin hydrochloride, riboflavin, copper citrate, cholecalciferol, calcum-L-5-methyltetrahydrofolate, manganese citrate, potassium iodide, biotin, apple fruit, pineapple fruit, sunflower oil, lemon peel, spirulina, rose hips (Rosa cantina fruit), whole brown rice, broccoli, spinach, mango fruit, carrot, West Indian cherry (Malphigia glabra fruit), papaya fruit, methylcobalamin, kelp, choline bitartrate, inositol, citric acid, natural flavours, pectin, natural colours, coconut oil and carnauba wax. As a food supplement for children, two chewable gummies once daily. Not intended for children less than four years of age. This product contains iron, which if taken in excess, may be harmful to very young children. Keep out of sight and reach. 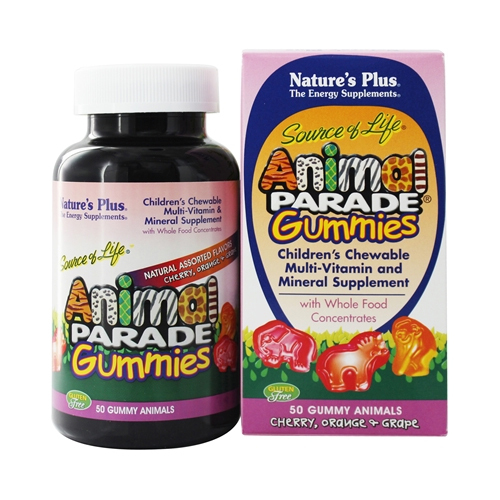 Below are reviews of Nature`s Plus Animal Parade Multivitamin & Mineral - 50 Gummies by bodykind customers. If you have tried this product we'd love to hear what you think so please leave a review.